We don’t want to downplay the horrific crime of slavery, but want to provide food for thought: debt is often taken on voluntarily; once taken on, however, one is forced to work to pay off one’s debt. 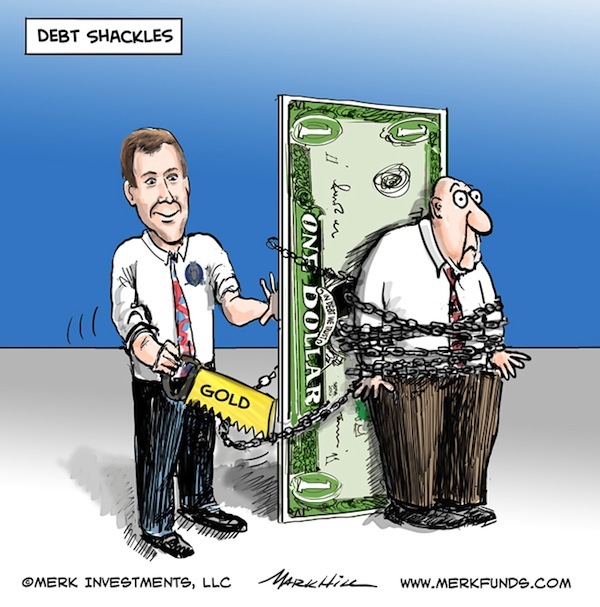 To be unshackled from banks and creditors, investors may want to consider living debt free and owning gold. Let us explain. Access to credit may fundamentally change one’s lifestyle. On the plus side, it opens the path to home ownership and access to capital goods, be that a car, or these days even a mattress or exercise machine. But it also makes the creditor, rather than oneself the boss. One symptom of the building credit bubble that caught my attention a decade ago was the rise of Spanish language billboards promoting mortgages. Proud immigrants in search of the American dream were lured into mortgages they could ill afford. Rather than focusing on feeding themselves and their family, the focus shifted to serving the bank. That shift only became apparent once the loan became too expensive to service, either because interest rates were resetting to higher levels or because someone lost their job and thus their income, but the debt remained. Indeed, Buffett has said that he would never allow his firm to be in a situation where he is at the mercy of banks. It doesn’t mean he will never borrow money. But it means that when borrowing money, he always wants to be in a situation where he could pay it back if needed. Consumers have seen all too often that they only qualify for a loan when they don’t really need it. Jamie Dimon, CEO of JPMorgan Chase has said responsible banks act like mothers: they will decline your loan request if it is too risky for you. One cannot be a truly free person with debt. While bankruptcy may have been downgraded to a mere business transaction in the U.S., some countries continue to put those that can’t pay into prison. The neighborhood surrounding Dubai’s airport has seen thousands of abandoned cars, often Ferraris or other expensive vehicles, as the formerly rich fled the country after their fortunes turned to avoid debtors prison. Anyone is likely to argue that a nice pile of cash in a bank account will make one feel financially secure – some place that pile at $100,000. Some at a million; as a million bucks isn’t what it used to be, the wealthy often say they are not comfortable if they don’t have $10,000,000 or more. We have met people with very modest means that feel that they are wealthy; and others that have lots of money, but don’t feel wealthy. Aside from the fact that some of them might simply have a distorted sense of reality, the wealthy often also carry a great deal of debt. Those able to manage their debt thrive in this low interest rate environment. But let even a wealthy person with debt hit a road bump, say lose a job (or face an obstacle in refinancing a loan) and such a person may quickly join the lower ranks of the 99%. In our assessment, highly accommodative monetary policy is a greater driver of an increasing wealth gap than the policies of either Democrats of Republicans. But even with $100 in a bank account, what does one really hold? One owns a promise by the bank to pay $100. The $100 bill is a Federal Reserve Note; it’s a piece of paper issued by the Federal Reserve. That $100 bill could be returned to the Fed; in return the Fed would issue a credit balance to your account (you would have to go through a bank, as the Fed won’t open accounts for individuals). The “resources” of the Fed are without limit: through its various quantitative easing programs, the Fed has increased the credit balances of the financial institutions where it has purchased securities. The Fed literally creates money out of thin air, with the stroke of a keyboard. Even prudent central banks like to see a little bit of inflation; it means that the dollar bills you hold erode in purchasing power, giving you an incentive to put the money to work to make up for the shortfall. Importantly, the $100 bill in your bank account is really someone else’s loan – the bank’s loan, the Fed’s loan. In fact, if you take out a loan from a bank, you will pay a merchant, who will in turn deposit the proceeds in his or her bank. As such, we talk about credit in a society. For simplicity’s sake, let the banks hold 10% in reserves; $100 in bank reserves with an offsetting $100 in demand deposit liabilities can thus be multiplied into $100 in bank reserves plus $900 in loan assets with an offsetting $1,000 demand deposit liabilities through the leverage of the fractional reserve banking system as banks lend and new deposits are made in a circular fashion. Between the Fed and the banks and the banks and their depositors the system can have a multiplier effect of about 100; that is, $100 created by the Fed can lead to $10,000 in credit. That’s why we sometimes call the credit created by the Fed (the monetary base) super credit. In the current environment, banks have not been aggressive in lending, and as such, we have not seen the “velocity” of money pick up. A key reason why many are concerned about the Fed’s increase in the monetary base is because it has the potential to fuel inflation. Indeed, a key reason I personally hold a lot of gold is not because of the environment we are in, but because I am concerned about how all the liquidity that has been created might be mopped up one day. Federal Reserve Chairman Bernanke claims he can raise rates in 15 minutes; we think there may be too much leverage in the economy to have the flexibility when the time is needed; the political will to induce a severe recession to root out inflation may not be there. It’s all about debt. So if one doesn’t want to have debt, what is one to do? The answer is real assets that are free of claims. Real estate held free and clear might be one answer, although keep in mind that governments tax real estate, thus making home owners tenants of the government. As the housing bust since 2008 has shown, the fact that many others owe a lot of money on their property changes the dynamics of this real asset. The purest form of a debt free asset is gold. Gold is true money, the only form of money that isn’t someone else’s liability. While central banks might be able to lower the gold price by dumping their own reserves, central banks cannot print more gold – it’s very difficult to ramp up gold production. If your bank goes broke, if Greece goes broke, gold will still be there. Some call gold a relic from the past. To us, it’s the purest indicator of monetary policy, precisely because it has little industrial use. 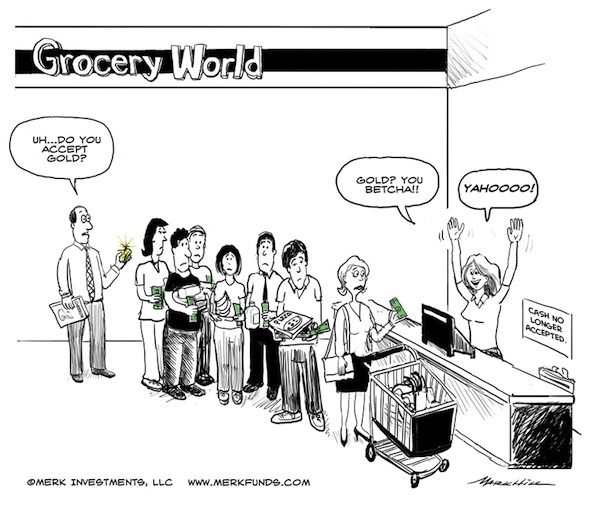 We created the cartoon below last year after CNBC’s Steve Liesman suggested to me on the air that gold might not be accepted in a store. Mind you, we are not suggesting that everyone should sell all they own and buy gold instead. Everyone should consult with his or her financial adviser for specific investment advice. Specifically, one must be keenly aware of the volatility the price of gold can have relative to the U.S. dollar; given that we have a lot of our expenses in U.S. dollars, one has to be aware of the fluctuating value of the investment relative to the U.S. dollar. But we want to get investors to be keenly aware that we live in a credit driven society. We also believe that the developed world has made too many promises, too much debt has been issued. Governments with too much debt may a) engage in austerity to pay off their debt; b) default outright; c) default though inflation. All scenarios suggest to us to hold assets that are debt free. We see gold playing a very important part in portfolios that take the risk into account that our policy makers continue to spend and “print” more money than is prudent. We don’t need actual money to be printed – credit creation through quantitative easing – is far more powerful. Please sign up to our newsletter to be informed as we discuss global dynamics and their impact on currencies. Please also follow me on Twitter to receive real-time updates on the economy, currencies, and global dynamics.